Zenda Jones is a Native of Chattanooga, TN and transferred into the Junior League of Atlanta in 2010, from Junior League of Dallas. 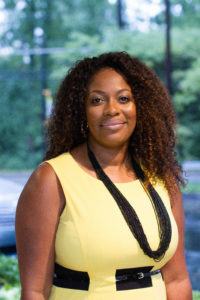 She currently resides in Buckhead and is a proud graduate of Alabama A&M University where she received her Bachelor of Science in Accounting. Zenda is a focused driver for the Safe Harbor Yes Ballot Committee with the United Way aimed at creating a fund for the victims of Human Trafficking. Her Advocacy work also includes a position on the Board of Directors for Youth Spark, which she also includes serving as treasurer. Professionally she is a Financial Software Consultant for a 3rd party Consulting Company based out of Dallas,TX. In her free time she finds time to travel the world and spend time with her family.